A combination of mobile technology and a sluggish economy is shrinking American cubicle, the target of office humor in movies such as "Office Space" and the Dilbert comics. (CNN) -- If you feel like your cubicle walls are closing in around you, you may be right. A combination of the troubled economy and the influx of mobile technology is changing the workplace landscape. Literally. Companies across the country are shrinking those boxed-in work areas or scrapping the notion of the once-ubiquitous cubicles altogether. At tech-giant Intel, employees who used to work in a 72-square-foot space now work in a cozier 48-square-foot station, company officials say. "Everyone used to get a cube, but that doesn't work for the way people actually do their work today," said Neil Tunmore, director of corporate services at Intel, who spearheaded the corporate redesign that began in 2007. In 1994, the average office worker had 90 square feet of office space, but the area had been whittled down to 75 square feet in 2010, according to the International Facility Management Association, a professional network for the facility management industry. 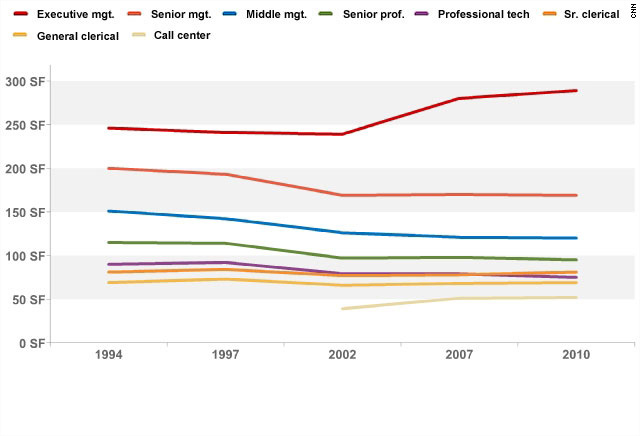 Space for senior office workers shrunk, too, from 115 square feet in 1994 to 96 square feet in 2010. But not to worry, that corner office keeps growing. During this same time, space for executive management actually increased. Gensler, a design firm in San Francisco has renovated spaces for 70% of the Fortune 500 companies. On average, they estimate those companies have downsized the cubicle from an 8-by-10 foot area to a 5-by-5 foot work space. Open-space seating found at companies such as Facebook are becoming a popular "team-oriented" model in the past 10 years, she says. "In recent years, we've seen how companies are trying to shed real estate cost," says Shari Epstein, director of research at the IFMA. "When you have less space to work, you will try to cram as many people into one space." 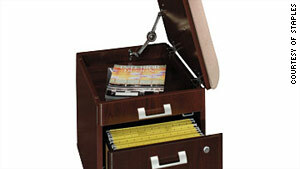 The word "cubicle," which emerged in the 15th century, is derived from the Latin word for bedroom. But the office partitions to which most white-collars workers are accustomed were introduced in the late 1960s. At the time, Robert Propst with Herman Miller Inc. of Michigan pioneered the idea of a more efficient open-office model called "Action Office," which became known as the cubicle. Cubicles became attractive because they were a functional way to give workers an office without relying on heavy construction, says Lisa Bottom, a design director at Gensler. 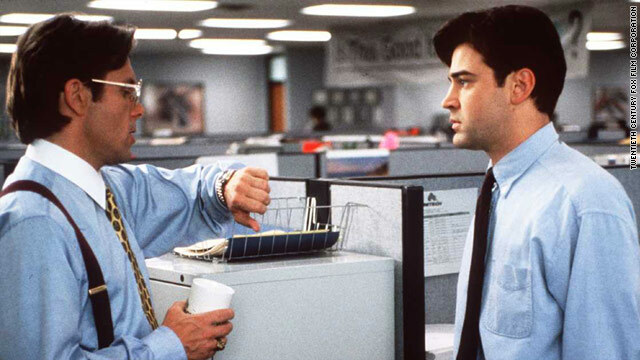 Over the years, cubicles have been mocked in popular culture such as the Dilbert comics and the movie "Office Space." "The panels made it so you could move it around," Bottom said. "It made it the job of the facility manager easier; it had little to do with making the worker's life easier." Several of the companies that have opted to reduce their cubicle sizes say their reasoning goes beyond simply boosting the bottom line. With flat screens replacing clunky monitors and the growing popularity of wireless products, such as such as laptops, iPads and BlackBerries, some managers say cubicles no longer make sense for workers who don't need to be tethered to their desks. And employees in the younger, more tech-savvy generation embrace the idea of working remotely and from different spots in the office. Smaller office spaces come with environmental perks. Less space reduces the carbon footprint, workplace and design experts say. In response to the shrinking workspace, sales of new lines of slimmer, lighter, eco-friendly furniture that often serve dual purposes have increased, says John Michael, general manager for business interiors at Staples, a leading office furniture seller. 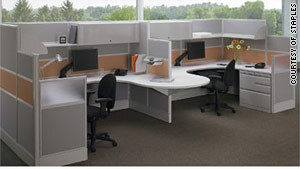 Cubicle furniture made of lighter materials and featuring lower walls are in high demand, according to Staples. For example, filing cabinets with plush tops that transform into seats and thinner cubicle panels have been in higher demand over the past five years, he says. Intel officials say when the cubicle downsizing began in four years ago, they eliminated extra furniture and waste. On one office floor, the company disposed of nearly 10 tons of paper, says Tunmore at Intel. While cubicle farms may be out, open shared spaces are in. To accommodate a smaller square footage, furniture companies are designing multipurpose pieces. Intel has created more conference and meeting rooms where employees can collaborate. Intel is also going wireless. About 30% of their employees in the renovated space don't have assigned cubicles, officials say. Instead, sales people and laptop users can grab chairs at kidney-shaped desks where they can boot up remotely. So how are employees adjusting to less work space? Martha Johnson, administrator of the General Services Administration, says the government has improved its efficiency by overhauling the large, clunky outdated cubicles spaces for the past few decades. GSA is a federal organization that rents out office space to government agencies. Many employees don't mind the smaller work spaces, Johnson says. She added that 30% to 50% of work space typically isn't used because of meetings or travel. "It's not about making it smaller," Johnson says. "It's about making it more flexible. People don't all want their own space." But Jeffrey Pfeffer, a professor of organizational behavior at Stanford Business School, says working in such close quarters may bother some employees who need more privacy or feel crowded. After all, he says, employees spend almost half their day at work. "Cubicles, and often times many of these cubicle farms, don't have very good acoustics, and so you are hearing other people and getting distracted," Pfeffer said. There is also the belief, particularly among baby boomers, that cubicles are a status indicator: More space equates to more power, workplace design experts say. Though it tends to be rarer case, some companies are taking the opposite approach to shaving off cubicle work spaces. For two years in a row, Fortune magazine has named SAS, a business intelligence software company in North Carolina, the No. 1 place to work. Company officials say they give almost all their employees private offices, which they say contributes to their success. "We do value an employee not just as a commodity," says Jim Davis, senior marketing officer. "But as an asset."